North and South Korea both developing ICBMs? 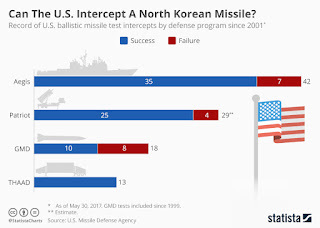 These days the global mainstream media are full of stories about North Korea's efforts to develop an intercontinental ballistic missile (ICBM) capable of delivering a nuclear warhead too the continental United States. 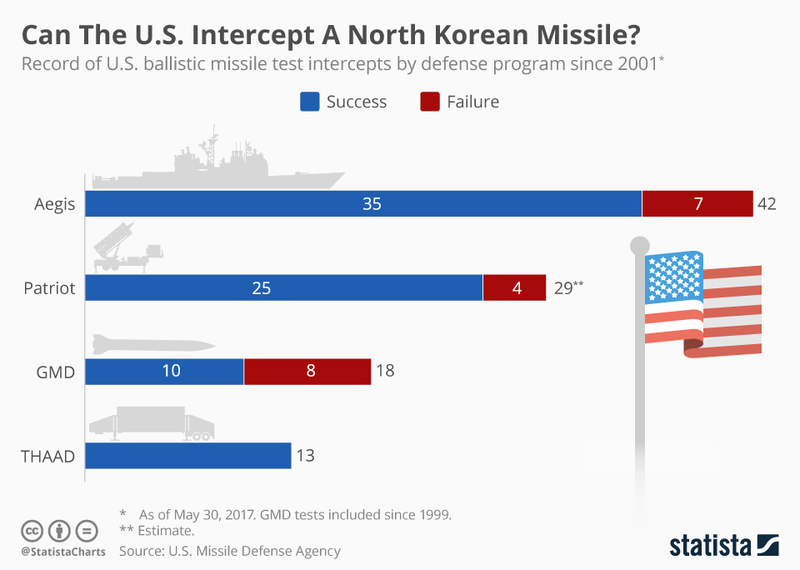 However, as noted in a recent article in The Korea Times, South Korea is also working on ICBMs, but of a different type. The first time I recall hearing about this was in a speech given at an international conference in Daejeon by former KAIST president Sung Mo Kang. He used the acronym ICBM to refer to Internet of things, cloud computing, big data and mobile technologies, just as The Korea Times article notes. Is Korea losing the race to build a green Internet? Greenpeace has just published the 2017 edition of its series entitled Clicking clean: Who is winning the race to build a green Internet. 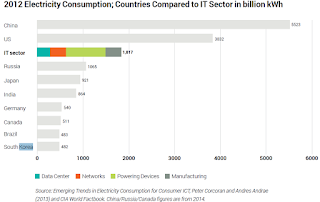 The report contains interesting data on the proportion of global electricity consumption accounted for by the ICT sector, scorecards rating companies on their adoption of renewable energy, and a section on Asia which compares China, South Korea and Taiwan. As shown in the graphic at left, (click for a full size version) only 1% of Korea's energy mix is currently renewable, compared with 5% in China and 4.2% in Taiwan. 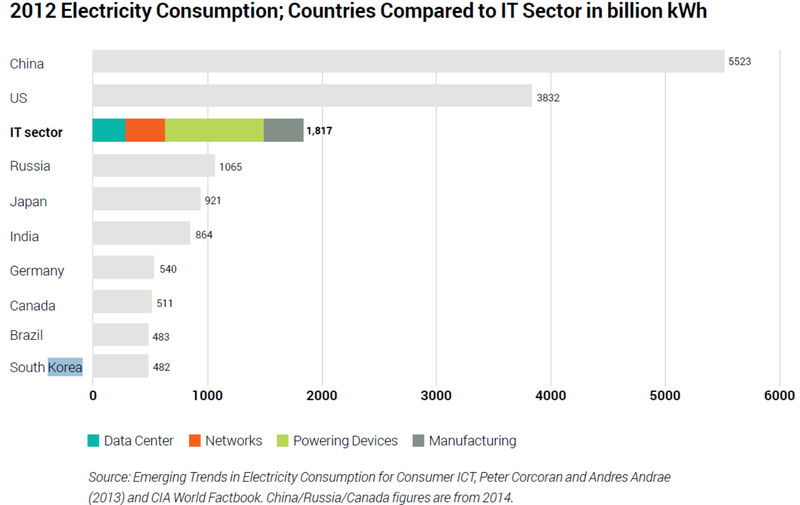 Another interesting graphic (shown at left--click for larger version)from the 2017 Greenpeace report compares the electricity consumption of the IT sector with that of major countries, as measured in billion kWh. 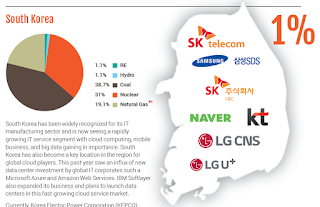 Those interested in where South Korea and its leading ICT sector companies stand in relation to other countries and global trends would do well to read this 2017 report. This week and next the students in my course on ICT for Sustainable Development are doing a big data and data visualization assignment. 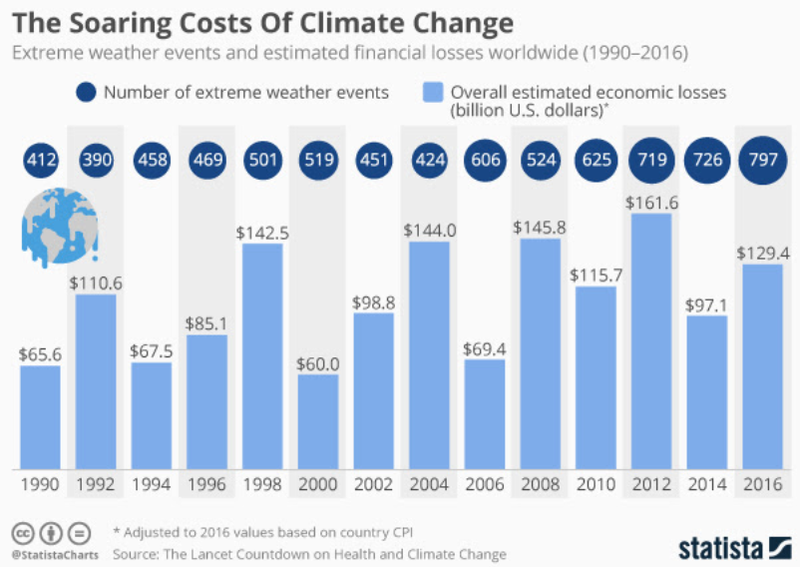 Here is an interesting infographic published by Statista based on The Lancet Countdown on Health and Climate Change. 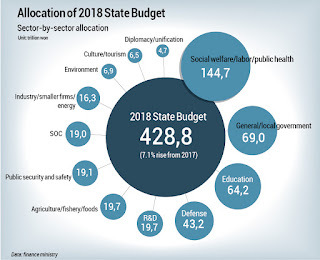 Explore the data in more depth and see where Korea fits in the regional and global picture at The Lancet's interactive infographic at this link. An article in The Korea Joongang Daily today sheds more light on the sources of record-breaking sales and profits at Samsung Electronics. (click on the graphic for a full size version) As shown in the graphic, device solutions including semiconductors and displays were the dominant source of operating profit, followed by IT and mobile communications, which includes mobile phones. 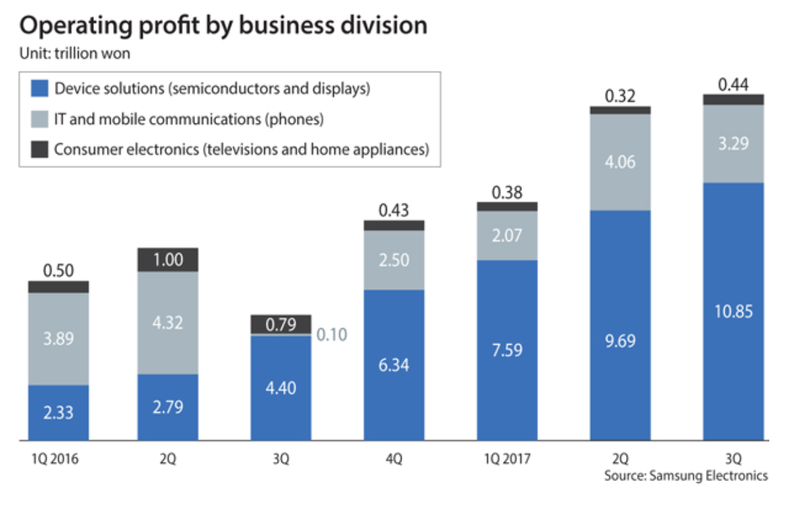 The article noted that "Revenue from Samsung’s semiconductor division amounted to 19.91 trillion won, while operating profit reached 9.96 trillion won. The figures translate to an operating profit-to-sales ratio of roughly 50 percent, breaking a 45.7 percent record reached during the second quarter. “As businesses that require high-capacity memory chips such as cloud and artificial intelligence services continue to expand rapidly, prices of premium chips are soaring high,” said Song Yong-ho, a professor of electronic engineering at Hanyang University." ‘전자산업의 쌀’ 반도체). The purpose of the metaphor was to convey that semiconductors would be, like rice, a staple commodity. Today, there is abundant evidence that chips are a staple of the burgeoning global ICT sector. 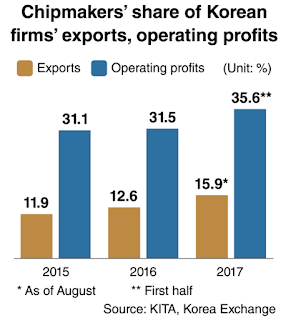 As reported this week by The Korea Times, they are now Korea's leading export, comprising 16 percent of 2017 exports. 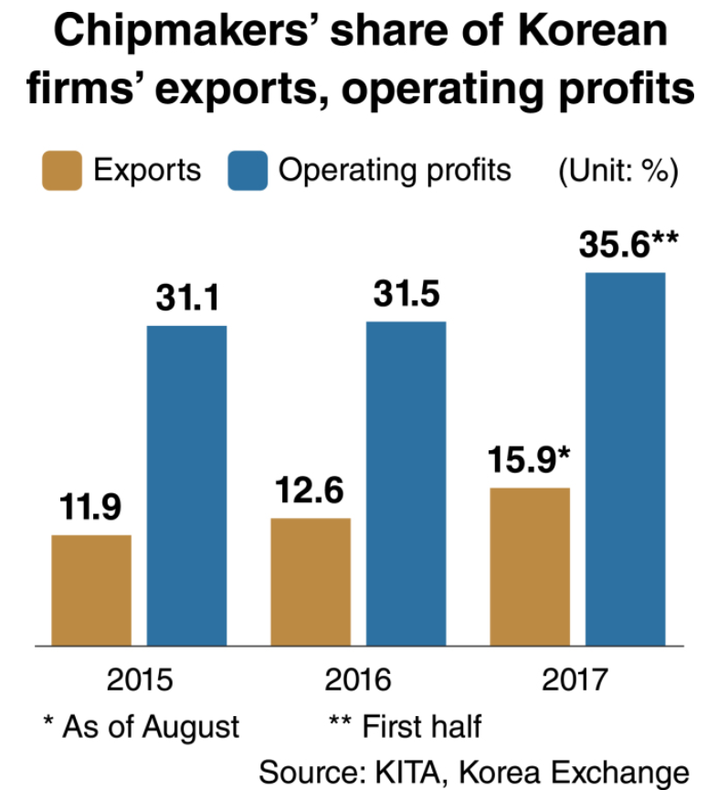 The dominance of semiconductors in Korea's export-led economy is illustrated in the accompanying graphic (click for a full size version), published in an article last month by The Korea Herald. As this article notes, commodity markets have their ups and downs and so there is risk in over-reliance on the semiconductor sector. There would be a similar risk if this nation were so heavily dependent on the export of rice. A short but very interesting article in The Korea Herald helps to answer the question of why Samsung and LG are so dominant in the local smartphone market here in Korea. Entitled "Foreign makers keep eye on changes in smartphone distribution" the article begins by noting that foreign smartphone manufacturers are paying attention to lawmakers' efforts to reform smartphone distribution channels. 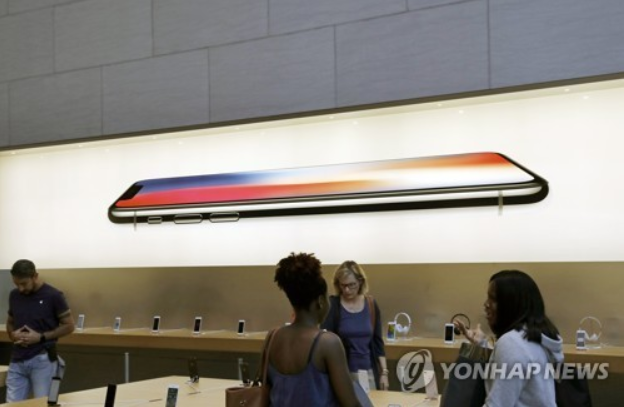 "Currently, the Korean smartphone market is dominated by two local firms -- Samsung Electronics with a 63.8 percent share and LG Electronics with 11.8 percent. Apple holds an 11.9 percent share." 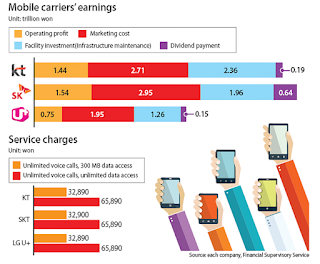 The article goes on to note that "The solid presence of Korean firms is partly driven by the nation’s unique distribution channels in which local telecom carriers entice customers by giving subsidies for Samsung and LG phones, based on prior arrangements between the carriers and handset makers. They provide less subsidies for Apple phones, as they have no prior arrangement with Apple, and provide none to other Chinese and Japanese brands because their phones are not sold via mobile carriers but through their own stores or online." Furthermore, " In Korea, only 8 percent of smartphone owners bought devices without going through telecom operators compared to the global average of 61 percent, according to the US research firm Strategy Analytics." It would appear that the days of such overwhelming dominance by Samsung and LG are about to end. Smartphones themselves are modular in nature and quickly become commoditized. 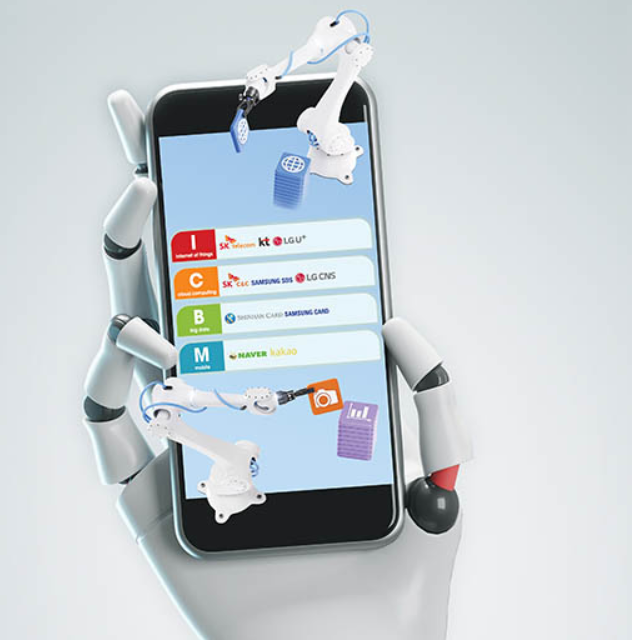 These trends suggest that Korea's leading companies, while not abandoning the design and manufacture of smart phones, need to move toward the software and services that these devices carry. A great opening ceremony. A great way to welcome FIT to SUNY Korea. In South Korea these days, the media are full of references to the "fourth industrial revolution." Every week seems to bring news of another international conference or ministry pronouncement about this revolution, as if it were an accepted reality. In fact, it is not universally accepted, and only in South Korea is the "fourth industrial revolution" so widely discussed and accepted. I did a bit of quick research using Google Trends. The first graphic (click for a full size version) shows patterns of worldwide search activity on Google for "fourth industrial revolution" and "third industrial revolution" from 2010 through the present. Note that the "third industrial revolution" is the title of a book published in 2011 by Jeremy Rifken, who himself disputes the claim that we have entered a "fourth industrial revolution." Not coincidentally, global search activity for "third industrial revolution" peaked in 2011, when Rifken's book was published. Similarly, searches for "fourth industrial revolution" peaked starting in January of 2016 when Klaus Schwab convened the World Economic Forum around that theme and released his short book on the subject. However, looking at global search patterns over time is only part of the picture. As shown in the second world map graphic (click for a full size version) which I captured while hovering over the dark red shading on South Korea, the search intensity index for Korea was 100 or highest in the world. The next highest index was 69 in South Africa. Interestingly, there was 0 search intensity in South Korea for "third industrial revolution." For those of you interested in why Rifkin disagrees with Klaus Schwab's contention that we've entered a "fourth industrial revolution," I refer you to his argument in the Huffington Post. Despite being a buzzword here in Korea, perhaps there are good reasons that it hasn't caught on all around the world. The book mentioned in my previous post, ICT-centric economic growth, innovation and job creation, was officially launched on October 11 in Buenos Aires Argentina. (click on the photograph taken at the launch for a full size version) A free copy of the book can be downloaded at this hyperlink. Also, interviews with the experts who authored chapters can be viewed by clicking on their names under the photographs at the bottom of this ITU web page. I authored Chapter 7, entitled "The Future of ICT-driven Education for Sustainable Development." Over the past year I've had the privilege of working with a group of experts assembled by the ITU to author a new book entitled ICT-centric economic growth, innovation and job creation. The book will be launched on October 11th at a Ministerial Roundtable on ICTs 4 SDGs in Buenos Aires Argentina. I authored Chapter 7 entitled "The Future of ICT-driven Education for Sustainable Development. A description of the book and links to interviews with all of the experts who contributed can be found at this hyperlink. My interview is embedded in this post for your convenience. Martyn Williams of 38North highlights a very interesting development in his latest post. He reports that "A major Russian telecommunications company appears to have begun providing an Internet connection to North Korea. The new link supplements one from China and will provide back-up to Pyongyang at a time the US government is reportedly attacking its Internet infrastructure and pressuring China to end all business with North Korea.The connection, from TransTeleCom, began appearing in Internet routing databases at 09:08 UTC on Sunday, or around 17:38 Pyongyang time on Sunday evening. Internet routing databases map the thousands of connections between telecom providers and enable computers to figure out the best route to a destination." Prior to this, Internet users in North Korea were all funneled through a China Unicom Link. As shown on the accompanying graphic (click for a full size version) TransTeleCom's fiber network extends right up to its border with North Korea. The significance of this development lies in the context of current efforts by the United Nations and the international community to sanction and economically isolate North Korea. The Trump-DPRK War of Words and the Pyeongchang Olympics: Some echoes from the 1988 Games in Seoul? As reported quite widely in the international media, the war of words between U.S. President Donald Trump and North Korea's leadership has sparked concern in some nations about security for the 2018 Winter Olympics in Pyeongchang. For example, as reported by Deutsche Welle, responsible officials in both Austria and France have publicly indicated that, if security deteriorates, their teams will not attend. The Pyeongchang Winter Olympics are scheduled to take place almost exactly three decades after the highly successful Seoul Olympics. As described in the following excerpt from my 1993 book with Heung Soo Park (downloadable full-text from Google Books) a political crisis also threatened the successful hosting of the 1988 Olympics. "It will be Seoul only. I don't know any other solution. If there will be no games in Seoul, there will be no games at all next year. We are not considering any other city as an organizing post. They've had outstanding preparations in Seoul and I can say that never has any city showed such a degree of preparation. They do have some internal problems in South Korea, but I think that situation is improving. We have received some very good news recently." (Larson and Park, Global Television and the Politics of the Seoul Olympics, Boulder: Westview Press, 1993, pp. 160-161)"
To be sure, the current crisis on the Korean peninsula is of a different nature and on a different scale than the one faced back in 1987. Three decades ago, the world was still living in the industrial mass media era, although on the verge of the digital network revolution. The common denominator is that the full success of the Pyeongchang Games depends, as did the 1988 Seoul Olympics, on the assurance of a safe environment for the athletes, coaches, staff and spectators. What the media miss about Korea! A word of warning. This is a long post with no graphics. As a U.S. citizen who has long resided and worked in South Korea and as a long term student of the role of television and the media in international affairs and foreign policy, I can no longer stay silent about mainstream media coverage of affairs on the Korean peninsula. The media, including television, the press, digital and social media have presented a picture of Korea that centers around North Korea’s nuclear and missile tests, the military confrontation on the peninsula, and the trading of insults via North Korean propaganda and the Twitter posts of President Donald Trump. Looking back over recent decades at the U.S. Korea relationship, it is clear that there has been a failure of both the press and policy. A long line of U.S. presidents, starting with Dwight Eisenhower, who was elected in 1952 on a pledge to end the Korean War have failed to achieve a peace treaty that would formally end that war here. It is no exaggeration to suggest that the failure to address Korea’s division and the tense ceasefire and confrontation at the DMZ is one of the great policy failures of the 20th century, blame for which might be apportioned to the two Koreas and the surrounding big powers, China, Russia, Japan and the U.S. The mainstream press has also failed. My own research and that of others in the latter part of the 20th century documented a pattern of intermittent coverage of Korea by television and other mainstream media, focusing on the Korean peninsula mainly at times of crisis. The picture or image of Korea that results tends to be superficial and seriously lacking in historical, political and cultural context. In today’s hyper connected, digital era, this pattern appears to be only exacerbated. To be specific, three topics deserve a great deal more attention when leaders and citizens around the world consider Korea today. First, in just over four months, the Winter Olympics are scheduled to be held in Pyeongchang, a city in Gangweon Do, the only province in South Korea that is divided by the DMZ. The legendary Diamond Mountain, site of North-South family reunions in years past, is in the northern half of the province. Pyeongchang itself is only about 40 miles south of the DMZ. Not coincidentally, some of the world’s most dense and advanced digital networks have been constructed in Pyeongchang and nearby venues as part of Korea’s plan to showcase next generation 5G networks along with some of the features of its nationwide Public Safety LTE network, schedule for completion by the end of 2018. 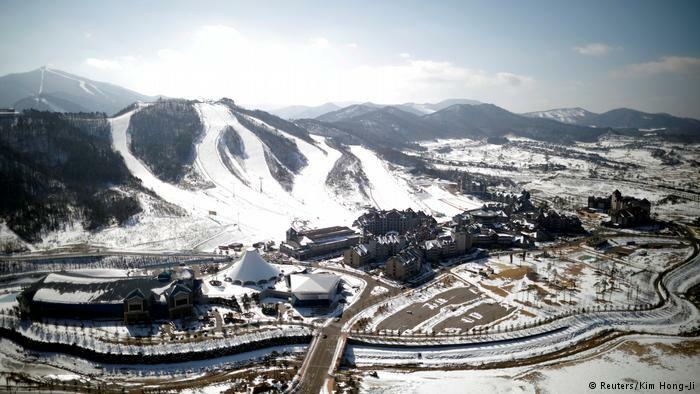 In another move that could hardly be sheer coincidence, North Korea’s young leader Kim Jong Un ordered construction of a “world class” ski resort near Masik Pass in the northern half of Gangweon Province. In historical context, the Pyeongchang Winter Olympics will take place almost exactly three decades following the 1988 Seoul Olympics. The Seoul Games were used very effectively to support the “Nordpolitik” of the South Korean government under President Roh Tae Woo. China, the Soviet Union, Eastern European countries and Vietnam all participated, nearly signaling an end to South Korea’s long Cold War isolation from those nations. The IOC and the South Korean government made strenuous efforts to involve North Korea, but to no avail. Today, the government of President Moon Jae-In is working with the IOC in an effort to have North Korea participate in the Pyeongchang Winter Olympics, against the backdrop of global media attention to the nuclear, missile and military threat on the peninsula. As this is written the sports minister of France publicly suggested that her country might skip the 2018 Winter Games if the security risk is too great. With just over four months to go before the games, other nations are no doubt considering their options. 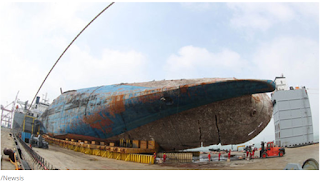 A second topic that receives scant attention in the mainstream media coverage of Korea these days is the impact that war on the peninsula might have on the global economy. Following President Trump’s “fire and fury” comment about North Korea in August of this year, Fortune magazine and much of the business press took note that war in Korea could spark a global depression. This possibility deserves more attention and in depth treatment, especially considering South Korea’s dominant position in global markets for semiconductors, displays of all types and sizes, and smart phones, key components of the emerging digital network ecosystem. Finally, the division of Korea can only be understood if it is placed in historical context. Korea can rightly claim a history stretching for thousands of years as a unified nation state. Consequently, the division after World War II which has lasted less than seven decades is clearly an aberration. The vast majority of Koreans, South and North, most especially those many members of divided families, yearn for unification. Here in the South, and I suspect in the North as well, most hope that unification will come peacefully. During the ancient Olympic Games in Greece, a truce was announced before and during the games to ensure that the host city was not attacked and so that athletes and spectators could safely attend the games. Perhaps the impending Pyeongchang Winter Olympics might provide an opportunity for an “Olympic truce” during which the heated media rhetoric might give way to solving the regional and indeed global crisis on the Korean peninsula. 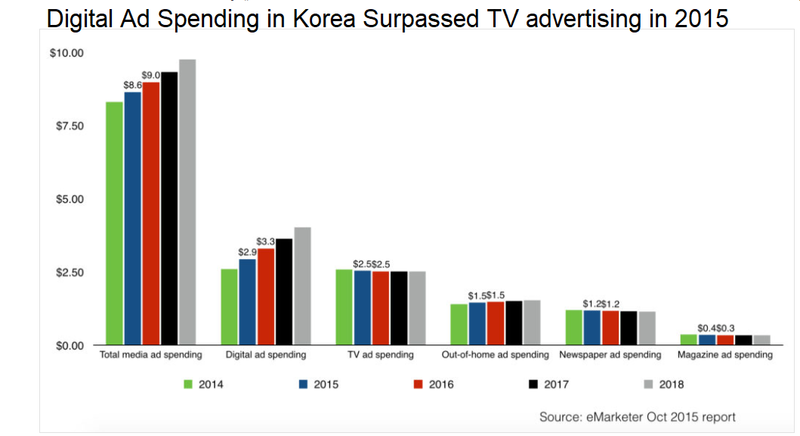 In Korea, as shown on the graphic at left from eMarketer, total digital (or Internet) advertising spending exceeded television advertising in 2015. 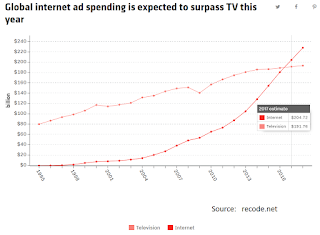 On a global basis, 2017 marks the year that total internet advertising spending exceeds television advertising, as shown on the accompanying graphic (click for a full-size version). 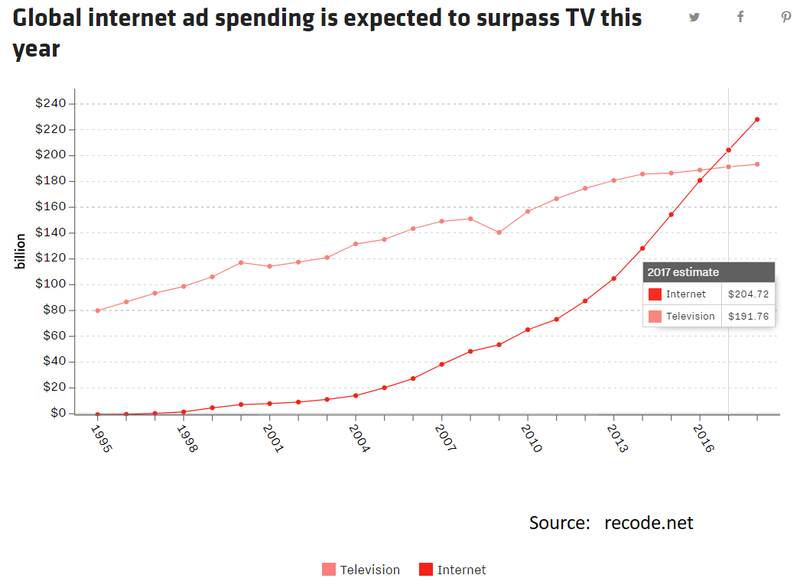 On a global basis, Internet advertising spending will exceed television advertising this year (2017), as shown in the second graphic, published by recode.net. (click for a full-size version) Not surprisingly, as reported by recode.net, Google and Facebook are the two dominant players on the global stage, and in 2016 the top 30 Internet advertisers accounted for 44% of global spending, an increase from only 33% in 2012. The data from these two charts show that Korea's digital development continues to proceed in advance of global trends. 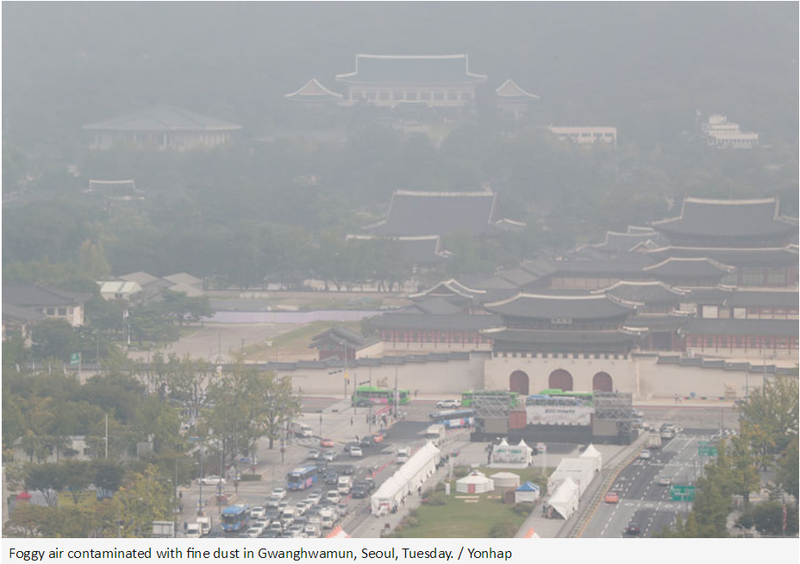 As reported in The Korea Times today accompanied by the photo at left (click for a full size version of this "all too familiar sight"), "Korea has worst air of advanced economies." Although The Korea Times report cites the OECD as the source, it appears the data come from The State of Global Air 2017 (download the PDF here)and its accompanying website (explore and visualize the data online here). I'm teaching an undergraduate class this semester on ICT for Sustainable Development (ICT4SD) with 24 students who no doubt have some of the same questions that you and I do about the extent, possible control and health effects of air pollution. We're using Korea as a point of reference throughout the class. One of my questions has been the relative contribution of China versus Korea to pollution over the Korean peninsula. We should look to the data, rather than our hunches for an answer to this question. 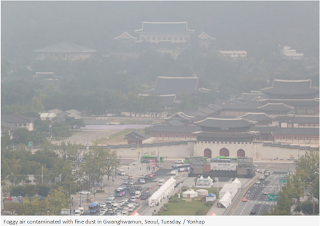 In that regard, current research seems to show that South Korea itself generates a significant proportion of the fine particle pollution in this country, and that pollution emanating from China also contributes, although not as much as one might suppose. In any event, the reduction of such pollution in northeast Asia will involve collaborative efforts by both nations. According to South Korea's Unification Ministry, fewer North Koreans have defected to the South this year. As shown in this chart published by Statista (click to see a larger version) "between January and August, 780 North Koreans managed to complete the dangerous journey and make it across the 38th parallel. 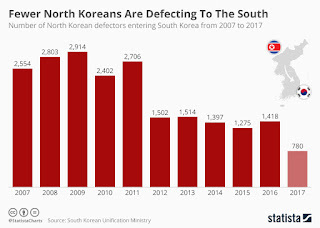 The decline is being attributed to tighter border security by China (where most defectors flee) and North Korea as well as enhanced government surveillance by Pyongyang." The overall pattern shown in the chart is also striking, given that Kim Jong Il, father of the current ruler Kim Jong Un, was in power through most of 2011. The pattern of defections clearly changed after the younger Kim assumed power and executed a number of military and party leaders, including his own uncle. Although they alone do not form the entire context for understanding what's going on in Korea, they definitely deserve more attention. My wife and I had just finished lunch earlier this afternoon. We live in a 15th floor faculty housing apartment on the Incheon Global Campus. Our apartment began to move perceptibly from side to side and hanging objects began to sway and make a little noise. This continued for 1-2 minutes about 12:31-12:32 P.M. It reminded us of the tremors we felt in our apartment during last year's 5.4 magnitude quake that centered around Kyongju. This time, however, the news media were reporting within minutes that the tremor was man-made. As reported by the Korea IT News and other industry sources, South Korea is planning to begin a national semiconductor R&D project that will require funding on the order of $2.2 billion (2.5 trillion KRW), with a goal of gaining the upper hand in next-generation semiconductor industries and maintaining Korea's position as a leading producer of semiconductors. The Ministry of Science and ICT (MSIT, formerly Ministry of Science, ICT and Future Planning MSIP) and Ministry of Trade, Industry and Energy (MOTIE) are currently planning for the R&D project, which will have a duration of 10 years. The project will be carried out from the second half of 2018. Furthermore, the report explains that the project is large divided into AI (Artificial Intelligence), IoT (Internet of Things), and equipment and materials related to production of next-generation semiconductors and will cover development of fundamental technologies and commercialized technologies. While fundamental technologies will be managed by the Ministry of Science and ICT(MSIT), commercialized technologies will be managed by the Ministry of Trade, Industry and Energy (MOTIE). As many prior posts in this blog have noted, semiconductors are a central technology for the digital era and Korea's success in this industry stems from crucial policy decisions made in 1980-81. 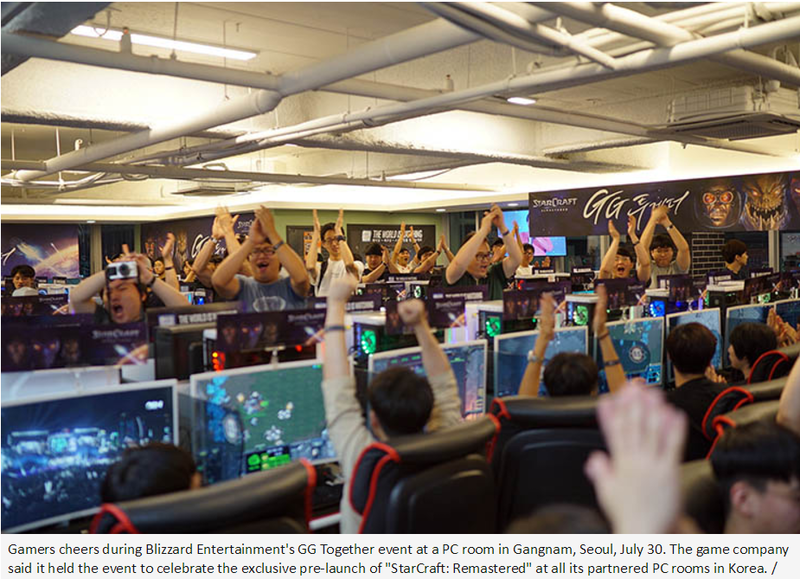 Blizzard Entertainments pre-launch release of Starcraft Remastered, the topic of my prior post, has generated some controversy in Korea, with PC Room owners complaining to the Fair Trade Commission about the pricing. According to a report in The Korea Times, Starcraft is regaining popularity with this new release. (click on the graphic for a full-size version) The article notes that "The 19-year-old computer online strategy game "StarCraft" is recovering its popularity with the exclusive pre-launch of its upgraded version in Korea, according to industry sources, Tuesday. According to its developer and distributor Blizzard Entertainment, about 28,000 copies of a special "StarCraft: Remastered" package have been sold so far. The special package has been exclusively released in Korea." The article quotes a source in Blizzard Entertainment as saying that "We have also released the game through all our partnered PC rooms since July 30, which numbers some 10,000 nationwide." Note that this statement MAY NOT indicate that 10,000 PC rooms have accepted Blizzard's terms and are offering the remastered game. However, this comment prompted me to update the bar chart published in my previous post with data from the annual Korea Game Industry White Papers published by the Korea Creative Content Agency (KOCCA). 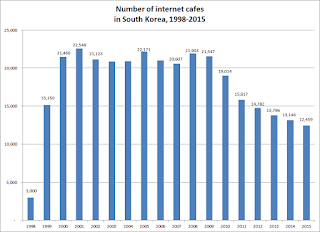 (Click on the chart for a larger version) This graphic depicts the "rise and fall" of PC Rooms in Korea between their introduction in 1998 and the end of 2015. 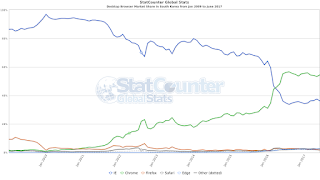 The fall or decline in PC Rooms was clearly affected by the arrival, beginning in 2010 (technically the end of 2009) of smartphones and the accompanying growth of mobile games, but there are other factors as well. 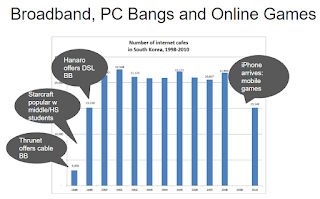 Overall the relationships among PC Rooms, MMOGs, the diffusion of broadband access and Korean culture, is a fascinating story. I'm happy to share this much of it with you. The release of a re-mastered version was inevitable, given the continuing popularity of the game and the significant technical advances in audio and graphics since its original release. It was also highly appropriate given the interesting and significant role of this massive multiplayer online game in Korea's digital network revolution. However, most of the media coverage to date, both technical and mainstream, has missed or glossed over the real historical significance of the game, which can be thought of in the following terms. 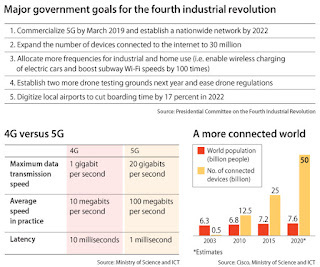 South Korea led the world in digitizing its networks, completing a fully-digital public switched telephone network by 1987 in what knowledgeable experts here call the "telecommunications revolution of the 1980s." 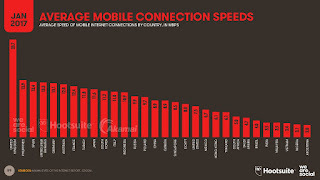 Consequently, in the early 1990s the country was a leader in the introduction of CDMA mobile service and broadband. A company called Thrunet began offering broadband service via cable modem in 1998. 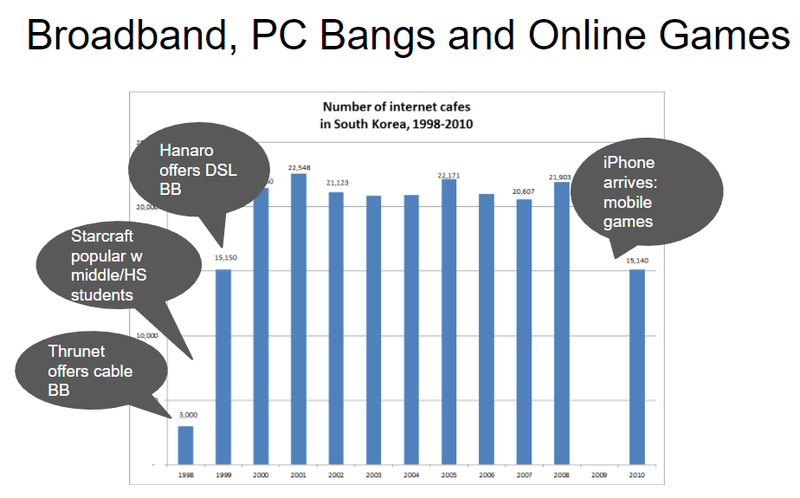 The introduction of broadband coincided with the release of Starcraft by Blizzard Entertainment and contributed to both the growth of Internet Cafes (PC Bangs) in South Korea and the popularity of Starcraft among middle and high school students, as shown in the graphic (click for a full size view of the slide) I use in my classes and lectures. Consequently, when Hanaro Telecom entered the market for broadband service, it aimed advertising for its ADSL service at parents, telling them that with Hanaro's service their children could play Starcraft at home, rather than coming home late from the PC Bang. The campaign was so successful that the waiting list for Hanaro service reached 500,000 and stayed at that level for a long time. There is more to this story but to summarize, consider the following. Digital broadband networks made massive multiplayer online games (MMOG) possible. 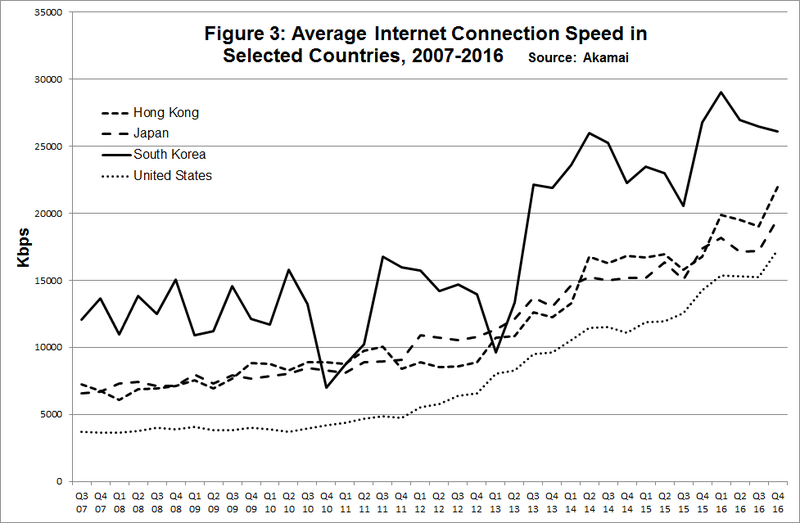 In reciprocal fashion, the popularity of Starcraft contributed to the rapid spread of household broadband access in Korea. MMOGs, beginning with Starcraft were invented in Korea. The nation had broadband and PC rooms (Internet cafes) years before other countries and its culture contributed to shaping the emergence of MMOGs and e-sports. Korea continues to play a major role, disproportionate to its population, in the evolution of online and mobile games, and e-sports more generally. 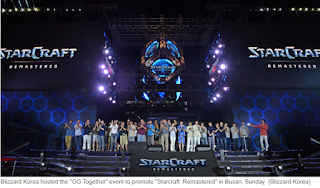 The role of Korean culture in shaping the success of Starcraft was described by Robert Breidenbecker, Vice President of Blizzard Entertainment, in a report published by The Korea Times as follows. 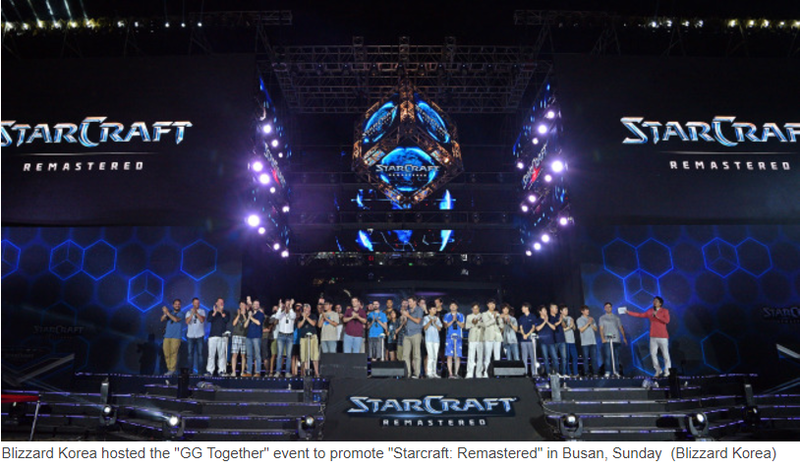 "The greater-than-expected success of the original "StarCraft" here made him believe the first mission in developing "StarCraft: Remastered" was to understand Korea. It was about being at PC rooms and how people engage with the game, like going out together for some barbeque together, having a couple of bottles of soju and playing a match of StarCraft. That was something that the people at our office had never experienced. It was the core of the market." A report by the threat intelligence company, Recorded Future, is attracting considerable attention in the mainstream media today, and appropriately so. (Read The Washington Post story here). Recorded Future is a startup company founded in 2009 with offices in Massachusetts, Virginia, Sweden and the UK. It delivers threat intelligence powered by machine learning. The company's patented technology automatically collects and analyzes intelligence from technical, open, and dark web sources. (click on graphic to see a full size version). In June and July of this year, Recorded Future published a two-part study of cyber and internet usage patterns in North Korea. The first report, entitled "North Korea is Not Crazy," examines North Korean cyber activity in the context of that nation's military strategy, national goals and security perceptions. The second report, entitled "North Korea's Ruling Elite are not Isolated," explores the internet activity of the country's ruling elite. The study is based on analysis of activity traceable to IP addresses that are known or suspected to be used mainly by North Korea's elites. Such analysis makes it difficult to completely eliminate the possibility that internet usage by foreign diplomats or journalists might be included in the results. Nevertheless, the findings are persuasive and represent the first such public study based on empirical data. Yesterday I attempted to book a KTX ticket from Incheon to Busan online and was surprised to see that Korail, among other public organizations, continues to require the download and installation of a Microsoft Active-X control in order to complete the transaction. At that point, I gave up my attempt to book the ticket, not wanting to expose my PC to the security risk that use of Active-X entails. The problem of Active-X has been apparent for many years, as illustrated by these prior posts. Three years ago, then- President Park Geun-hye assembled a large group of business leaders at the Blue House and implored them to stop using Active-X. Today it is truly amazing that this issue continues to hamper Korea's online commerce. 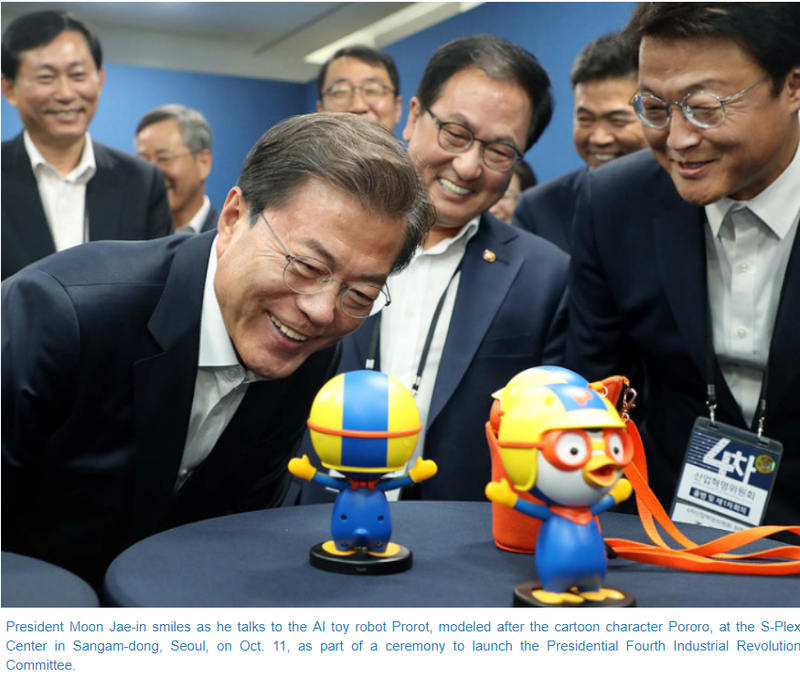 It is a subject of media attention again, now that the new administration of President Moon Jae-In has promised to rid the country of its reliance on Active X. See, for example, this article in The Investor. Part of the problem is the continued widespread use of Microsoft's old Internet Explorer browser in Korea. 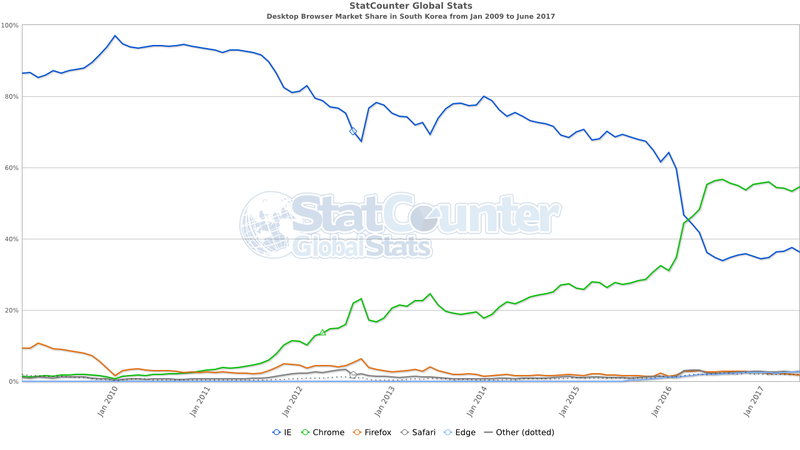 As shown in the first graphic (click for a full size version) the Chrome browser overtook Explorer in early 2012 on a worldwide basis. 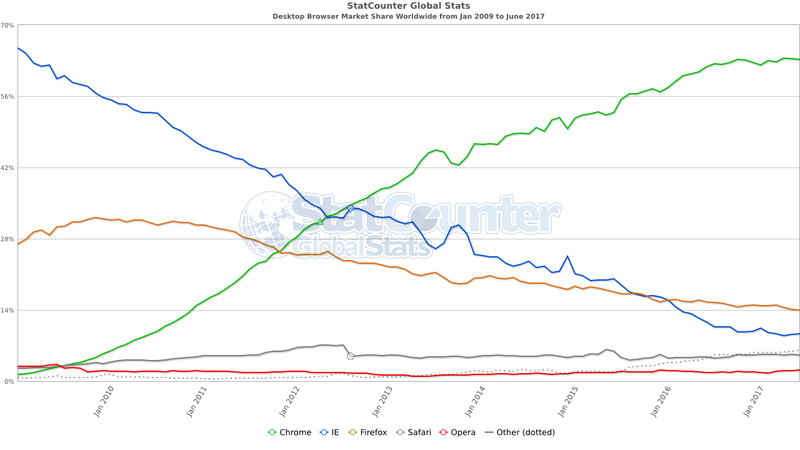 In sharp contrast, according to Statcounter, usage of Chrome only overtook Internet Explorer in Korea as of early 2016, a full four years later. (click on the second graphic for a full size version) In fact, Japan and Korea are the only major economies where a large portion of the population continues to use Internet Explorer. Microsoft's new Edge browser does not support Active X because it is a security risk and the company has warned consumers of the dangers of Active X for years. At this point, "bizarre" is not too strong a word to describe South Korea's entrenched reliance on Active X. It is damaging to the economy and a major security risk. It may relate in part to this nation's heavy concentration on hardware manufacturing and export rather than software and services. However, the rest of the world has long since moved away from Active-X and it is long past time that South Korea does as well, before this situation becomes even more of an embarrassment. The international media have noted that Psy's Gangnam Style is no longer the most watched video on YouTube as measured by cumulative views. (Click on the graphic to see a full size version.) As reported by the BBC,"The surreal video became so popular that it "broke" YouTube's play counter, exceeding the maximum possible number of views (2,147,483,647), and forcing the company to rewrite its code." 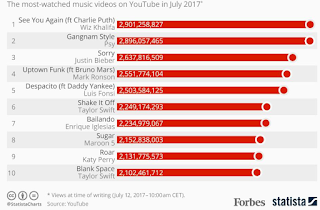 Gangnam Style has now been overtaken by another music video - Wiz Khalifa and Charlie Puth's See You Again, a heart-wrenching ballad that has now been streamed 2,895,373,709 times; beating Psy's current count of 2,894,426,475 views. 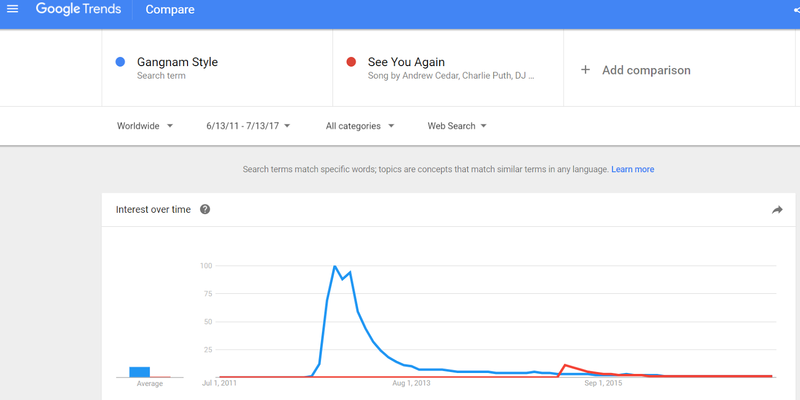 Another measure of the global impact of Gangnam Style provides important context for comparisons with See You Again. 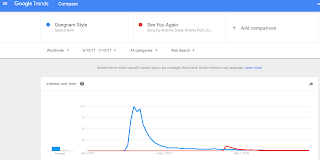 The accompanying graphic (click for a full size version) shows the worldwide volume of searches for Gangnam Style and See You Again, respectively. Narrowing the Google Trends analysis to "You Tube searches" produces a similar graph. Not only did Gangnam Style break the YouTube play counter. It also produced a higher level of global interest, as indicated by web searches, than the newer See You Again. Sports diplomacy: co-hosting of the PyeongChang Winter Olympics? Is it possible that North and South Korea could come to an agreement to co-host the 2018 Winter Olympics? Stranger things have happened. Three decades ago, South Korea and the IOC held serious negotiations with North Korea about arrangements for the north to participate in the highly successful Seoul Olympics, but fell short of an agreement. For a more detailed treatment, see my book with Park Heung Soo, Global Television and the Politics of the Seoul Olympics. 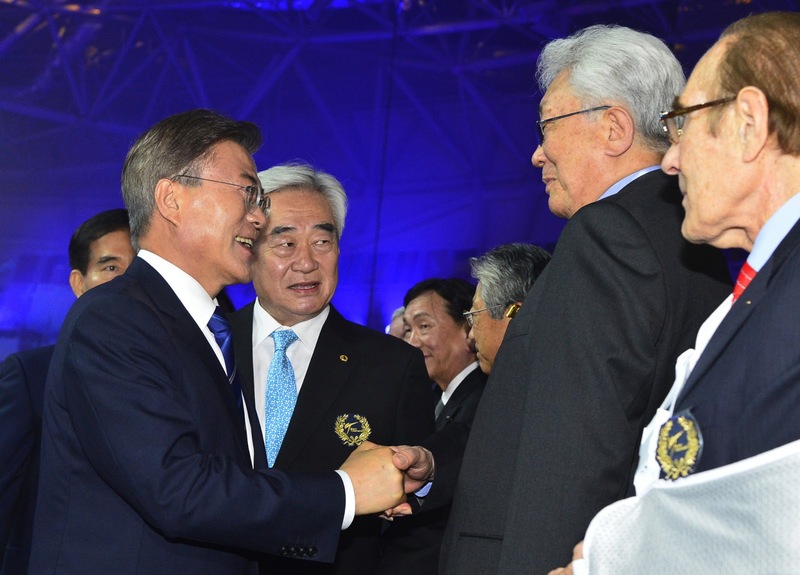 Could sports diplomacy play a role in resolving the tensions on the Korean peninsula? I think it is definitely a possibility, and one that should not be ruled out. 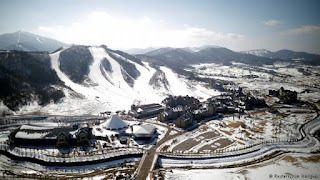 See this 2013 post published when I learned that North Korea was building a "world class" ski resort in the northern part of Gangwon Province. Korea to end dependence on nuclear power? As of 2017, according to the International Atomic Energy Agency (IAEA)this nation relied on nuclear power plants to supply fully one third of its electrical power. (click on the graphic to see a full size version) Thanks to nuclear power, this nation enjoys relatively inexpensive and dependable electric power, whether one lives in its large cities or in rural areas. This semester, I had the privilege to teach a class to a group of five executives from the Korea Hydro and Nuclear Power Co. and learned more from them about the current state of this nation's electric power grid. Furthermore, having lived in South Korea continuously since 1996, I've enjoyed the dependable electric power supply that has helped fuel this nation's ICT-driven economic development. It will indeed be a major challenge to "wean Korea off nuclear power." 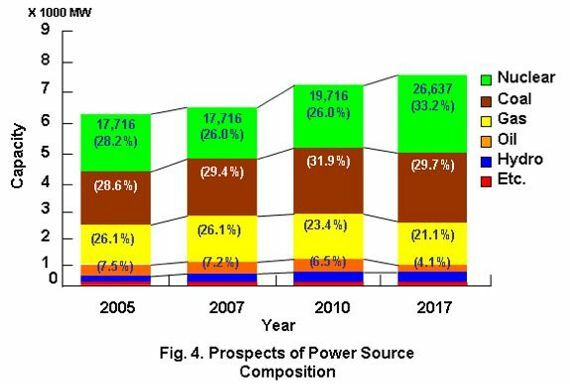 In short, President Moon's declaration of his intent to shift Korea from dependence on nuclear power generation to renewable sources is a major policy change. It is a bold move, on the order of the Lee Myung Bak administration's dramatic shift from brown growth to a green growth strategy. Along with many here in Korea and around the world, I can only wish President Moon and his administration well on achievement of this laudable goal. It is an investment in future generations and the future of the planet. The Chosun Ilbo English edition carried an article today entitled "Search for Ferry Victims Nearly Complete." The last sentence of the article struck me as the most interesting and potentially most important for victims of the tragedy and their families. 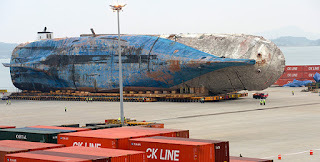 It read, "Of 87 mobile phones retrieved from the wreck so far, 15 have been sent to a private company to retrieve text messages and other data that can shed light on the tragedy." Collusion on phone service fees? 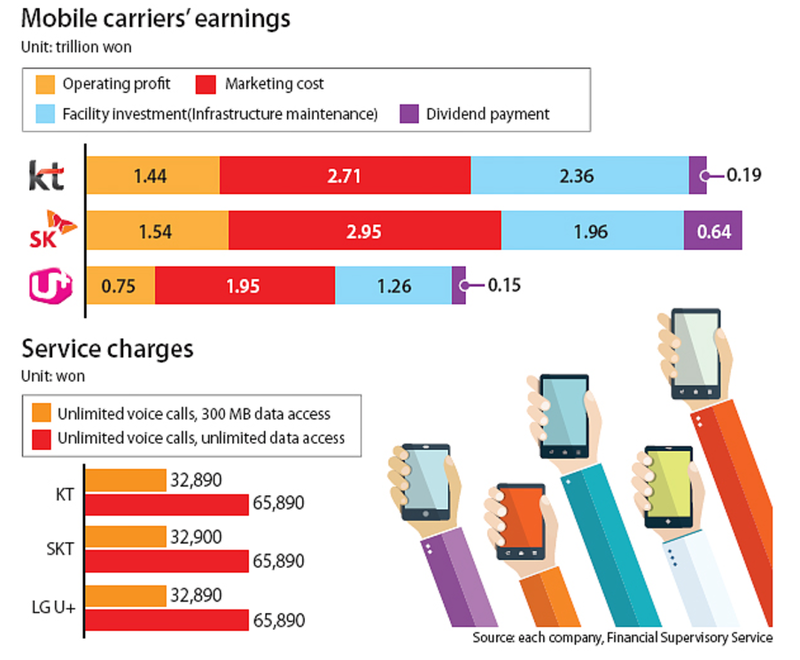 As reported today in The Korea Joongang Daily, some observers are claiming that there is collusion among the three main mobile service providers in the setting of service fees. As shown in the accompanying graphic (click for a full-size version), all three service providers have nearly identical service charges. Consequently the civic group People’s Solidarity for Participatory Democracy (PSPD), has raised suspicion of collusion. The civic group reported its suspicions to the Fair Trade Commission on May 18. As reported by TheStack.com "Nokia along with Finland’s State Security Networks Group, and Telia, have successfully trialed a priority system whereby public safety communications are triaged over other data traffic in LTE networks. The trials, according to a Nokia release, demonstrated the ability to prioritise traffic for first responders in busy 4G networks." This is an important development, since no country will want to let a public safety-LTE network sit idle simply because there is no crisis or disaster occurring. The report also noted that "Public safety is a priority for many networking and edge computing projects. Earlier this year, Ericsson and Intel announced the launch of the 5G Innovators Initiative (5GI2), with which initial development includes augmented and virtual reality applications for first responder drone surveillance." Mainstream media and tech blogs are full of reports that the recent massive ransomware cyber attacks may be linked to North Korea. 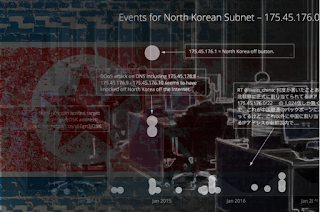 This episode adds more evidence that Korea's division is both a military and a digital one. 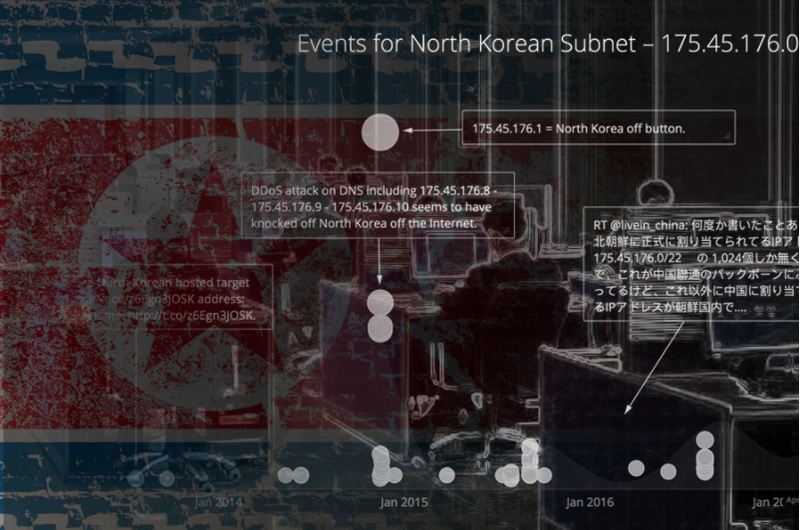 One example of current reporting is The Guardian's report similarities were spotted between details of last week’s massive cyber-attack and code used by a prolific cybergang with links to North Korean government. 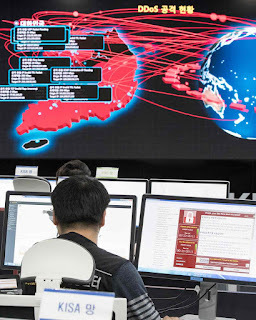 The graphic at left (click to see a full size version) shows employees at the Korea Internet and Security Agency (Kisa) in Seoul at work on May 15 monitoring possible ransomware cyber-attacks. The Hangul in yellow at the top of the large wall screen says "공격 현황 "or "attack status" in English. The Guardian story, notes that "The WannaCry exploits used in the attack were drawn from a cache of exploits stolen from the NSA by the Shadow Brokers in August 2016. The NSA and other government agencies around the world create and collect vulnerabilities in popular pieces of software (such as Windows) and cyberweapons to use for intelligence gathering and cyberwarfare. Once these vulnerabilities were leaked by the Shadow Brokers, they became available for cybercriminals to adapt for financial gain by creating ransomware. This ransomware spread rapidly on Friday by exploiting a vulnerability contained in the NSA leak, targeting computers running Microsoft’s Windows operating system, taking over users’ files and demanding $300 to restore them." I would only add that this latest cyber attack episode underscores that the division on the Korean peninsula is both a military one, symbolized by the 38th parallel DMZ and a deep digital divide. Quite clearly, North Korea seeks to advance both its missile and nuclear weapons programs and its capacity to wage cyber warfare. Earlier this year, we are social and Hootsuite published a slide deck entitled Digital in 2017 Global Overview, drawing on data from Google, Akamai and other sources. Overall, this collection of statistics and graphs meets the goal implied in its title, by providing a valuable global overview of the rapidly changing digital landscape. However, as illustrated by slide 89 (click to see a full-size version of the graphic), the publication also demonstrates the risks that human error can creep into the compilation and publication of such data. The slide indicates that data came from Akamai. 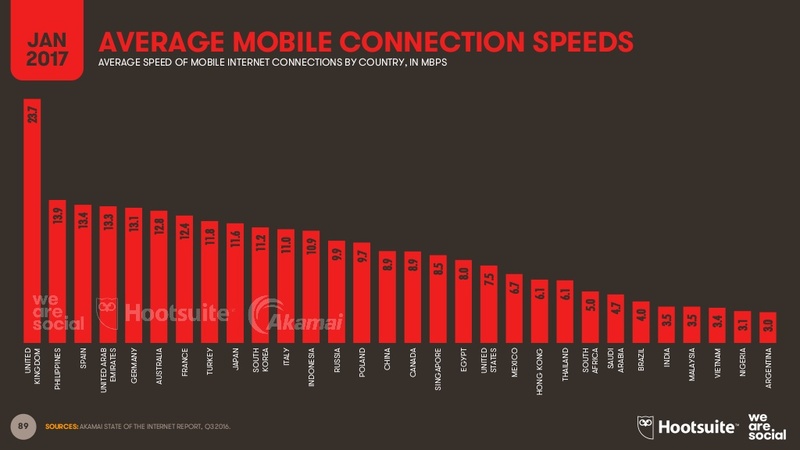 However, according to the Akamai data, the tall leftmost bar must surely represent data for South Korea, which has led the world in average download speed since 2007. 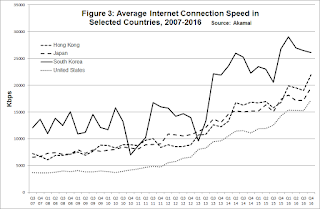 The chart at left (click for a full size version) is from my most recent publication, "Network-centric digital development in Korea: Origins, growth and prospects," published by Telecommunications Policy. It is based on the same Akamai data referred to in slide 89, but does not include the UK because that country was not among the top tier leaders by this measure. One of my hobbies over the past decade or more has been collecting examples of errors in research reports and scholarly publications about the ICT sector in Korea. This slide is definitely an addition to the collection. I would hope that Hootsuite and we are social might acknowledge the error and publish a correction to this slide. I'm not holding my breath, but one never knows. A correction would underscore the importance of accuracy and reliability in reporting of cross national data such as those underlying this slide. 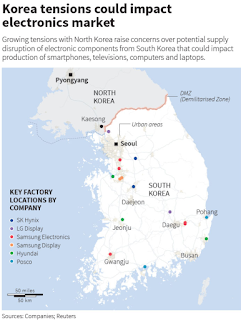 War in Korea and the global electronics market? The common denominator in the Bloomberg and Reuters stories is a surface-scratching, sketchy, or vague understanding of Korea, and in particular its ICT sector. For one thing, the R&D and manufacturing capacity of big companies like Samsung and LG today are spread around the world, including locations like Austin Texas, cities in China and Vietnam (smartphone manufacturing). 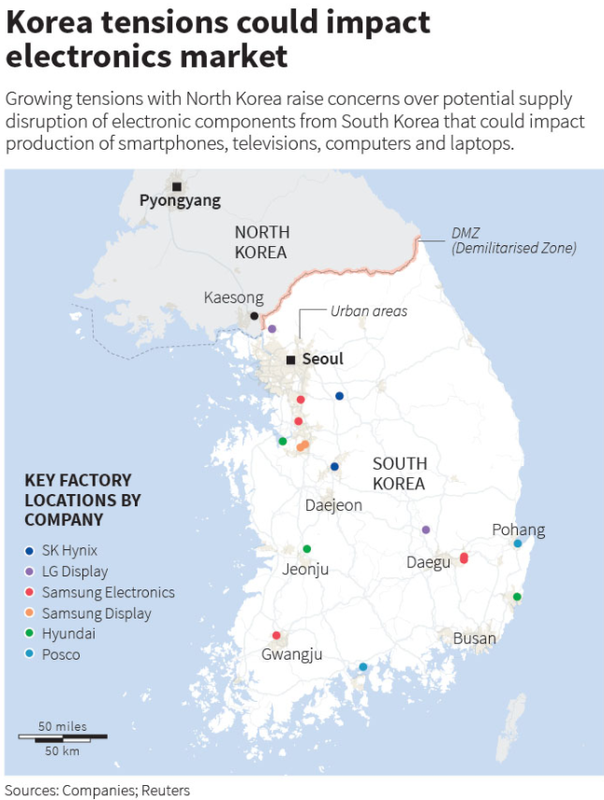 How the global electronics industry might be affected by a hypothetical war in Korea is indeed a much more complex matter than these press reports indicate. It deserves much more thoughtful and in-depth scrutiny. I've been to Seoul several times this year and there is a new presence in the city. It is called the Lotte World Tower. It not only adds a dimension to the Seoul skyline, but also sets one Korean and two world records. First, it is the tallest skyscraper in Korea and the fifth highest in the world. Second, it has the highest glass bottom observatory in the world, at 478 meters or 1,568 feet. Third, it features the world's tallest and fastest double-decker elevator, called the Sky Shuttle. For further detail, see this CNN story. Fake news: "Korea used to be part of China"
As reported widely in Korea's domestic media, including The Chosun Ilbo, U.S. President Donald Trump, in an interview with the Wall Street Journal claimed that "Korea actually used to be a part of China." His claim was based, he said, on conversations he had with visiting Chinese President Xi Jinping. 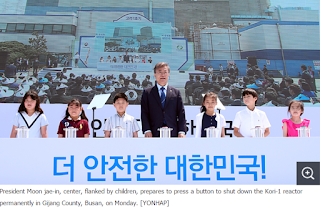 As readers of this blog will know, I've had a longstanding interest in how mainstream media cover, or do not cover, Korea and what this means for government policymaking. (see these posts, for example) However, this comment by President Trump is still astonishing. The truth is that the northeastern area of China used to be part of Korea. Also, it is worth remembering that Korea's history as a unified nation state, with its own distinctive culture and language, goes back thousands of years. Korea is not and never was a part of China, although it shares many characteristics. Likewise, it was only a part of Japan during the first half of the 20th century because of forceful occupation. President Trump's astonishing claim will only further cement his reputation as the source of "Fake News." The Sewol Ferry, which tragically sank in the Spring of 2014 is finally back on land. The accompanying photo was published by the Korea Joongang Daily. Hopefully this long, drawn out tragedy will soon come to an end as investigators search the vessel. Readers of this blog will know the relevance of this story to the development of Korea's digital networks, (see prior posts) especially its public safety LTE networks, scheduled to begin operation in late 2018. Yesterday Korea's constitutional court upheld the impeachment of President Park Geun-hye. Consequently, she was immediately removed from office and a snap presidential election will be held on or before May 9. The events leading to the impeachment and removal from office of President Park Geun-hye came as a surprise to me, despite the years I've lived in Korea. The situation is more complex than it may appear from mainstream news media reporting. Former President Park did indeed major in electrical engineering at Sogang University, which helps to understand her creative economy emphasis. As close observers of Korea well know, every presidential election is followed by a reorganization of the nation's leading ministries. Sometimes these reorganizations are minor and sometimes sweeping, as when President Lee Myung Bak assumed office in 2008. Further complicating matters for international observers is the re-naming of ministries along with the challenge of translating the ministry name into English. I did a series of posts on this matter following Park Geun-hye's election as president. The danger that the incoming administration faces, following the snap elections which will take place within 60 days, is "throwing the baby out with the bathwater," to use an old English expression. In fact, Korea's "Future Ministry," named the Ministry of Science, ICT and Future Planning in English, has done a number of worthwhile things, including the establishment of 18 Centers for Creative Economy and Innovation (CCEIs) throughout Korea. More importantly, it brought the former Ministry of Science and Technology under one roof with the Ministry of Information and Communications. After all, the main technology driving changes in the world today is digital technology, allowing dramatic increases in the human ability to store, compute and communicate information on a global or even inter planetary scale. Given the rapid pace of digital development, globally and in Korea it would seem that the incoming administration might be well advised to keep those elements of the Park Geun-hye administration policies that are realistic and forward looking, and avoid the temptation to throw everything out and start again. 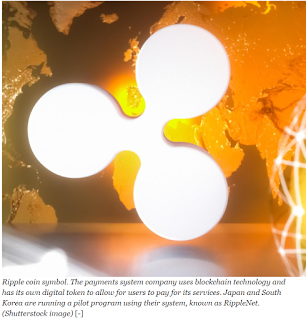 This is especially crucial given the widespread recognition that Korea needs to make the transition from heavy reliance on hardware manufacturing and export to software and services. The news that Bixby, the tentative name for Samsung's forthcoming artificial intelligence (AI) powered assistant, will support seven to eight different languages, is getting considerable attention in the trade press around the world. 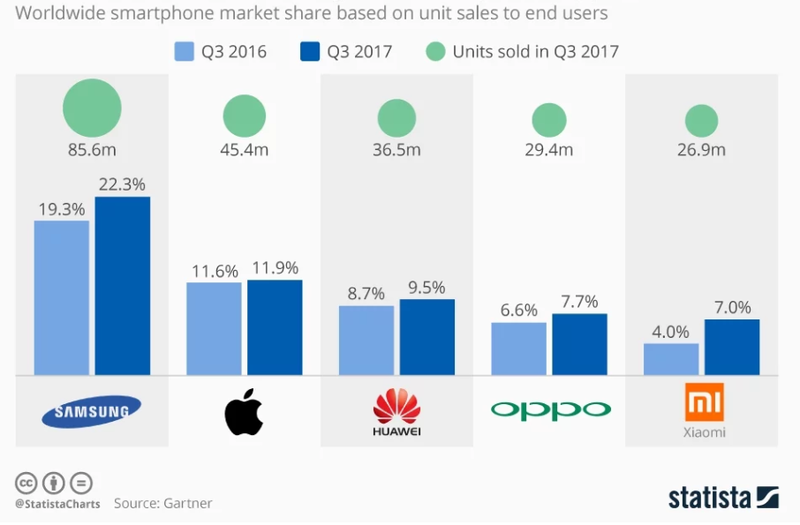 Some of that attention focuses naturally on Samsung's rivalry with Apple in the smart phone market and also competition from Amazon. As noted by CNet, "Launching its own smart AI assistant is an important move for Samsung and its future Galaxy and Note phones. The company, which strives to dominate the smartphone world against Apple's iPhone, stands to win fans if its Bixby assistant can outperform Google's Assistant, Apple's Siri and Amazon's Alexa, which will land on its first phone later this month." Google's AI powered assistant on its Pixel phone is also a competitor. 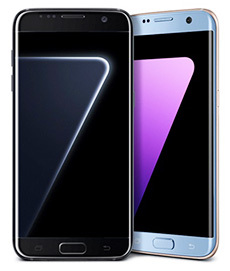 As a large, more broadly based electronics firm, Samsung may have some advantages. According to the Korea IT News, Samsung Electronics wants to use the capabilities of Bixby not only to promote its smartphones, but also to promote its household appliances and Samsung Pay as well. Samsung Electronics’ plan is to have an upper hand in the AI ecosystem in wide range of areas by linking Bixby to its electronics and household appliances including televisiions, refrigerators, and washing machines. Considering the present capabilities of smart devices, the AI era is advancing very rapidly indeed. This underscores my message in a January 9 post that smart apps are more important than the phones themselves. A post from Geneva on "the ITU and the Trump administration"
I'm writing this post in the library of the International Telecommunications Union (ITU) in Geneva, where I've spent the past two weeks working with an expert group on a forthcoming study. I fly back to Korea tomorrow. Since my secondment to the ITU coincided with the start of the Trump administration I couldn't help but talk with colleagues here about the strange new twists and turns of U.S. politics. One of my ITU colleagues passed along a copy of this article, published January 25 by Anthony Rutkowski, a longtime employee of the ITU. It is a thoughtful piece and I recommend it to you. When I first arrived in Korea as a young American Peace Corps Volunteer in 1971, cash was king. Virtually all commercial transactions were conducted in cash. That meant that one of our priority tasks upon arrival was to have a personal dojang (seal) made so that we could open a bank account and deposit or withdraw cash. I lived in Chuncheon, the capital of Gangwon province, but Peace Corps living allowances were dispensed in cash at the Peace Corps Office in downtown Seoul, near Gwanghwamun, so we traveled to Seoul on average twice a month. How times have changed! 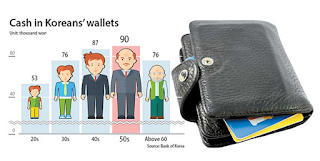 These days, Korea leads the world in use of various forms of electronic payment, including credit and debit cards, smart phones and most recently the introduction of Internet banking. According to the Bank of Korea, only about 20 percent of financial transactions these days involve cash. Welcome to 2017 in the world's digital network leader!